I’m almost getting to feel like an anthropologist on those rare occasions when I go into an RV park to visit a friend or acquaintance. I’m detached, observingwondering what is this world I’m now in? Followed byhow long do I have to be here?! People actually live in these densely populated, rule-bound communal parking lots. The parks are like little urban villages in the wide, open west. Might as well live in a trailer park and have a shed out back. At night one sits outside, sometimes watching TV, surrounded by so many pole lights, party lights, patio lights, and lit up palm trees that only a few stars can be seen up in the night sky. Most of these retired or semi-retired people I’ve been coming across the last few years seem to spend their days sitting in their rigs, driving into town or along the roads to see what they can see from their butts. Very few go out and look around where they are staying. One rarely sees them walking along the nature or hiking trails, let along going off where there are no trails, or even bicycling along the dirt roads. It seems such a waste to be out-and-about and not take the time to see what’s there. Doesn’t seem to be much awareness of nature in them or the ability to see how much one can get from the simple things. Even most rangers and just about all of campground hosts in these parks don’t seem to know what’s in the area unless they can see it from the roads or from the back of an ATV. They probably think it’s age that has turned them into the shape they are in. These victims of comfort tend to live with one foot in the grave and not even know it. Almost makes me wish I didn’t know people older than me who can hike circles around me. The idea of nomadic freedom the RV world professes is basically a myth. These people leave their old lifestyle and go off to escape only to find themselves in a claustrophobic closeness with every rig’s curtains drawn, everyone is inside, and the next rig parked 12’ away. 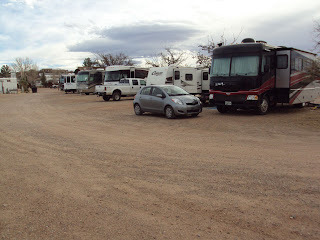 RVers long for independence but find themselves tethered each night to cable, water, electricity, and sewer lines. Seems more like dependency. They have reduced their possessions, simplified their life, and moved to living on wheels. There’s such an opportunity to put some spice and adventure back in their livesand they drop the ball. And after the first year or so, many only move their rig two or three times a year. If one needs to have others constantly entertain them, then this might be the way to go. Living in RV parks and playing the tourist is quite the norm for most full-timersbut others are not satisfied with so little. 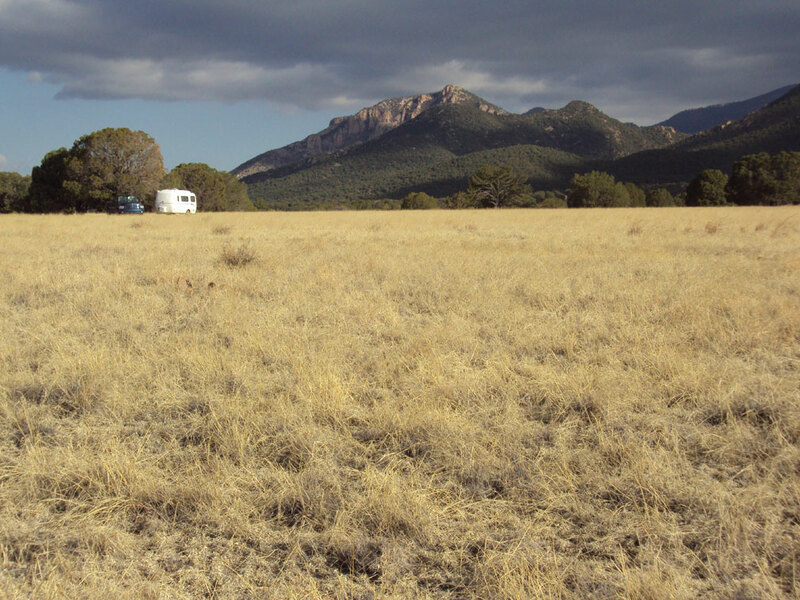 A few full-timers spend most months dry camping out on public lands or in primitive campgrounds. They learn the pleasures of sitting quietly and listening to the rush of water and wind through the trees. One’s small trailer becomes something like a small hutprotective, yet inviting one outdoors. The Outdoors is where one can go to get away from the status quo and truly have a taste of freedom and independence. The world of nature can be both a presence and a companionnature nourishes us. It’s here that one can feel our deepest belonging and affinity. This faction probably thanks the gods that most full-timers and RVers in general, stay in RV parks, out of the countryside, and off the ungraded roads. These campers sit outside at night, look up, and don’t just see a few starsthey see the whole galaxy and more. The stars come right down to the horizon360. Different strokes. When making choices, opt for the plain, the simple, the functional. Less goes wrong when you stick to life’s standard equipment. Heron Lake has five campgrounds, two with hookups, for a total of 115 sites and a few more places where camping is allowed. A lot of rocky mountain junipers and pinon and some nice space between sites. With the annual $225 pass, the sites without hookups are free and the ones with electricity are $4. One can stay for 21 days. Heron Lake has about ten miles of trails for hiking, running, and mountain biking. Very nice. I generally always see some osprey on my morning runs. The lake can be beautiful shades of green when the light is right. REALLY need to get a kayak next year if the other lakes I’ll be checking out are as nice as this one. Been practicing Tai Chi, hitting the trails, sent some silver pieces out, shooting my long bow, and watching the moon work towards full. Life is good. The last two nights it has gotten down into the single digits. The first night I was caught off guard. One of the uncertainties of camping without hookups. When I had to reach over and light the catalytic heater at only 11:00, it should have clued me in. Normally I don’t have to do that until I’m ready to get up or it goes down into the teens and rarely that early in the night. The other clue should have been Meadow and Onyx kept trying to crawl into my mummy bag. But the fun part was the first morning. I had two catalytic heaters going and used the stove to heat up water for chai and a clay flowerpot for additional heat. One window next to where I sleep was cracked open a bit but the range hood vent was closed because it was so windy when I turned in (it is usually always wedged open with a clothespin for ventilation no matter how cold it is). After drinking my tea I noticed a candle I had burning to help dry out the air had gone out. The wick appeared fine so I relit it. I went to light the stove for breakfast. The lighter would no longer work. I lit a match and it went out. I lit another and same thing. The candle also went out again. I’m starting to think canaries and mines. I went outside, leaving the door open, and wedged open the range hood vent. All the windows were frozen in position so I could not open the one by my bed any more or the others at all. After keeping the door open for a bit, low and behold, as if by magic, I was able to light the stove. Who would have thought a little oxygen could be so useful. I found it interesting that I was not getting a headache, drowsy, or dizzy. Oh well, turned out to be no big thing. The second night was fine since I was prepared for another single digit night. I guess if I did not take things like this in stride I would opt for hookups and electric heat. One of the rangers invited me over for her birthday party. I’ve never been into parties but we all had a stellar time. Started off standing around a campfire in her backyard, watching the full moon come up, drinking wine, and telling stories and jokes. Very nice people. Fish and Game have been netting the kokanee salmon, milking them, collecting millions of eggs, and then sending the eggs over to the hatchery. They have to wrap it up before snagging season. I was getting spoiled with my sitesecluded with a safe area for Meadow and Onyx to roam. Then snagging season started and many of the campsites started filling up. Snaggers are a different class of people from regular fisherman, let alone campers. Definitely not my kind of people. Have got to be out of here by the second Friday in November next year. What a zoo! I had always thought snagging was a type of commercial fishing. I can’t imagine what barbless fly fishermen say about snagging. Snow crushed the grocery store up in Chama so getting groceries was a bit of a drive, like an hour. So one day I tagged along with Siscily down to Alcalde for a shopping run. She also pointed out Georgia O’Keeffe’s house in Abiquiu. OLD little town. One can see that O’Keeffe did not have to go that far for inspiration for her paintings. While in Chama, be sure to check out the blacksmith, across from the Chevron station. Nice work. The tourist office offers free wi-fi. The laundromat up on Pine St. has a book exchange shelf. The Stone House, four miles south of Heron Lake also has a book exchange shelf. 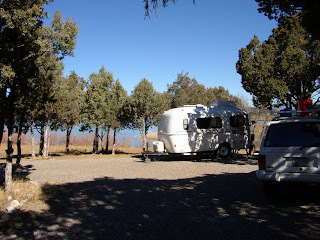 If you stay at Heron Lake, DEFINITELY stop in Otra Vuelta in Los Ojos. Robert Archuleta makes custom mats out of old tires with just about any color combination of colored spacer beads that you want. VERY reasonably priced. I got mats for the Cherokee and a doormat for the camper. I’m stuck here through the first few days of snagging season since I’m waiting for my monthly mail package. Would stay here longer but I do not want to be here for another weekend of snaggers. Then its down through Santa Fe and east to Villanueva State Park along the Pecos River. Smile and get others to smile.